Another method of circuit analysis employs mesh currents. The objective, similar to that of node analysis, is to generate one independent equation for each independent variable in a circuit. 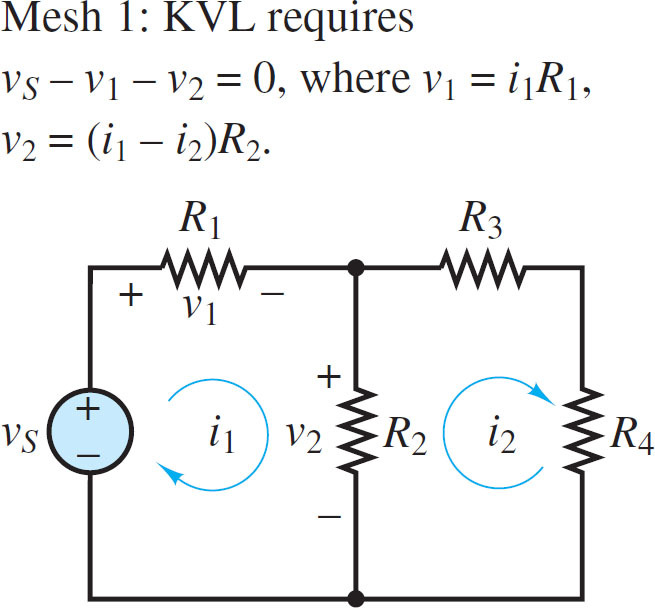 In this method, each mesh in a circuit is assigned a mesh current variable and Kirchhoff’s voltage law (KVL) is applied at some or all of the meshes to generate a system of equations that relate these variables. It is important to recall that mesh currents are not the same as branch currents. 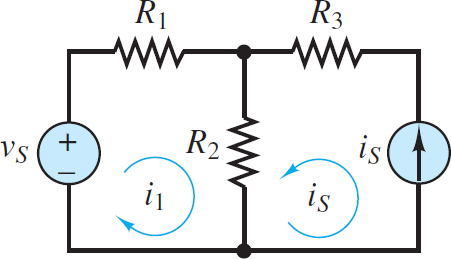 The perspective taken in the mesh current method is that there is one current circulating within each mesh and that branch currents in the circuit are comprised of these mesh currents. Specifically, when a branch is part of only one mesh, the branch current is the same as that mesh current. However, when a branch is shared by two meshes, the branch current is comprised of two mesh currents. Which of these expressions is the right one to use? The answer depends upon the convention used when applying KVL. Figure 2 Ohms law implies that current is directed from high (+) to low (-) potential. 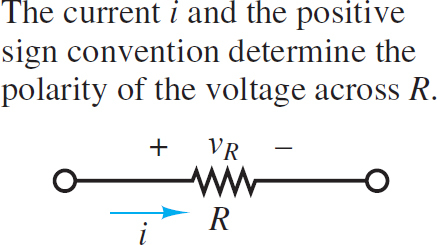 Notice that the net current through R2 in the direction of mesh current i1 is (i1 – i2). 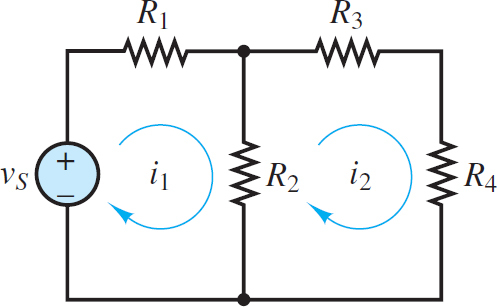 The following procedure outlines the steps taken in applying the mesh current method to a linear circuit. 1. Select a circulation convention (either CW or CCW) for the mesh currents and KVL. 2. Define mesh current variables i1 i2,…, in for each of the n meshes. • If the circuit contains no current sources, then all n mesh currents are treated as independent variables. ◦ There are n − m independent variables. ◦ There are m dependent variables. ◦ When a current source borders only one mesh, the value of that mesh current is dictated by the current source. 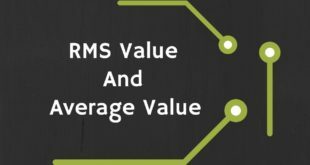 Treat that mesh current as a dependent variable. ◦ When a current source borders two meshes, the value of the difference in those mesh currents is dictated by the source. Treat one of those mesh currents as a dependent variable and the other as an independent variable. 3. Apply KVL at each mesh associated with an independent variable, using Ohm’s law to express each resistor voltage drop in terms of the adjacent mesh currents. • For each current source is there will be one additional dependent equation (e.g. is =ik −ij). 4. Collect coefficients for each of the n variables and solve the linear system of n equations. • Some of the dependent equations may have the simple form ij =is. In this case, the total number of equations and variables is reduced by direct substitution. 5. 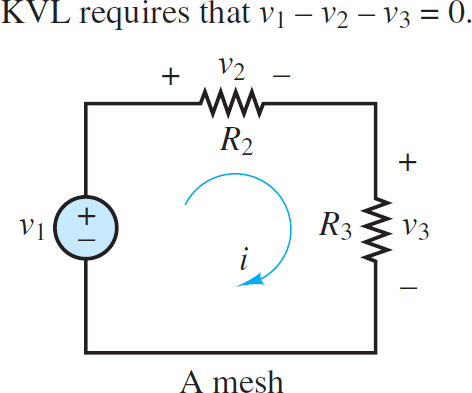 Use the known mesh currents to solve for any or all branch currents in the circuit. Any voltage drop can be found by applying Ohm’s law and, when necessary, KVL. This procedure can be used to find a solution for any planar circuit. A good approach is to first practice solving circuits without any current sources and then learn to deal with the added complexity of circuits with current sources. These two equations can be solved simultaneously for the two independent mesh current variables i1 and i2. The branch current through R2 can then be found as well. If the resulting numerical answer for a mesh current is negative, then the actual direction for that mesh current is opposite of the defined direction. Note that the expressions for the voltage drop across R2 in the two KVL equations are different because the same clockwise convention is used in both meshes for KVL. In mesh 1, the KVL loop traverses R2 from top to bottom while in mesh 2 the KVL loop traverses R2 from bottom to top. The result is a potential source of confusion and error when applying the mesh current method. A careful determination of the voltage drops around each mesh, one mesh at a time, and in accord with the positive sign convention for Ohm’s law, is necessary for success. It is common, in practice, to encounter current sources in electric circuits. The relevant steps found in the above section are listed below with added comments. Step 1: Select a circulation convention (either CW or CCW) for the mesh currents and KVL. • There are n − m independent variables. • There are m dependent variables. • When a current source borders only one mesh, the value of that mesh current is dictated by the current source. Treat that mesh current as a dependent variable. • When a current source borders two meshes, the value of the difference in those mesh currents is dictated by the source. Treat one of those mesh currents as a dependent variable and the other as an independent variable. The circuit in Figure 6 has two meshes and one current source. Thus, there is one independent mesh current variable i1 and one dependent mesh current variable i2. Note that the circulation of i1 indicates a clockwise convention. With that convention, i2 has the opposite direction of is in the rightmost branch. Thus, i2 = −is and Figure 6 shows the second mesh current as is circulating counterclockwise. Step 3: Apply KVL at each mesh associated with an independent variable, using Ohm’s law to express each resistor voltage drop in terms of the adjacent mesh currents. • For each current source iS there will be one additional dependent equation (e.g., is = ik – ij). Step 4: Collect coefficients for each of the n variables and solve the linear system of n equations. • Some of the dependent equations may have the simple form ij = is. In this case, the total number of equations and variables is reduced by direct substitution. The presence of the current source has simplified the problem. There is only one unknown mesh current, i1, and one equation. 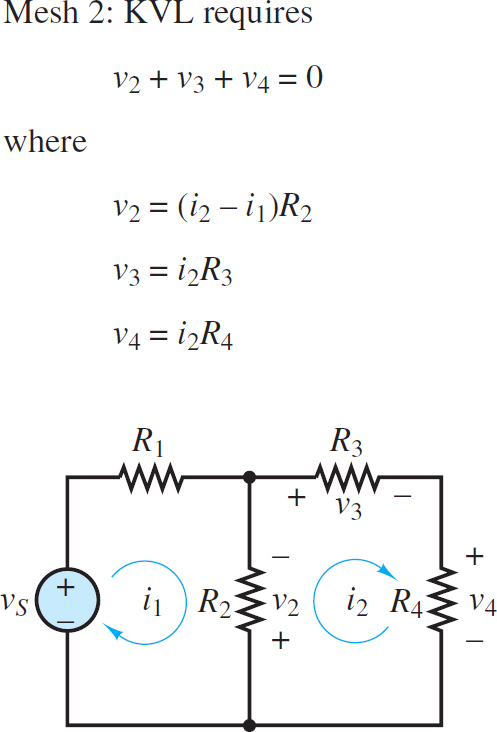 Step 5: Use the known mesh currents to solve for any branch current in the circuit. 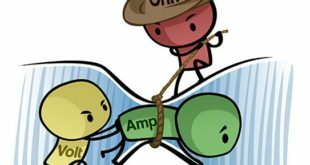 Any voltage drop can be found by applying Ohm’s law and, when necessary, KVL. 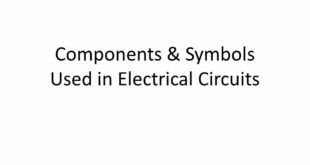 It is important to understand that Mesh or Loop analysis can be applied to either AC resistive circuit or DC resistive circuit. In any type of network, the numbers of linear equations are dependent on the number of loop currents.